n he speaks. It is common to see Mike playing poker on TV, and you might have already guessed that he is always talking, usually with his good friend Daniel Negreanu. 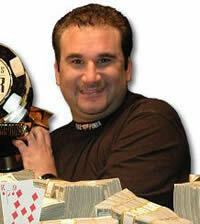 Mike Matusow was born in Los Angeles, CA on April 30, 1968. Mike loved competition and always found new ways in which to compete. Building race cars, shooting pool, and bowling, are all examples of the sort of things Mike did just for the competition. Before becoming a poker player, Mike “The Mouth” spent time as a poker dealer. He analyzed the hands that he dealt to the players, and soon felt confident enough in his skills to enter a small tournament, which he won. Buoyed by this success, Matusow entered more small tournaments and found his bankroll escalating along with his confidence. He began playing in cash games, specializing in Omaha 8/Better. Mike is now considered to be one of the best Omaha 8/Better players in the world. him out of a pot in which Mike knew that Carlos was bluffing, but couldn’t make the call. Carlos showed the bluff and Mike was later eliminated by Dewey Tomko. Mike won his second WSOP bracelet in 2002 after beating Daniel Negreanu in a $5,000 Omaha 8/Better event. In the 2005 WSOP Main Event, Mike “The Mouth” finished 9th out of the record field of 5,619 and won $1,000,000. Later in 2005, Mike won the WSOP Tournament of Champions, picking up another $1,000,000 payday. Mike has had his share of personal problems. He spent six months in prison on drug charges from late 2004 to early 2005. During his time in jail, Mike had very few visitors, poker player John Juanda being one of the few. After being released, Mike had to rebuild his life, which he has managed to do, with the help of some friends, including Phil Hellmuth who gave Mike a $5,000 loan with which to restart his poker career. Mike has regained control of his life and is striving to be a better person. Mike was formally a member of Team Full Tilt, the group of professionals who played and taught on the online poker site Full Tilt Poker.